Everyone is looking for a way to make their products stand out. If, you use Thermography on a business card, foil stamping on your invitations, or UV on your brochures, you know that adding a little extra to your print products can make them stand out from the rest. There are a number of ways to beef up your pieces and make a unique impression. You may be looking for a unique feel or to add some protection. Either way, you should know the available options and what their benefits are. Thermography or raised ink is the process of heating ink to make it bubble and rise. This can be done in a variety of colors and creates a 3D print effect that is unmistakable and impressive. 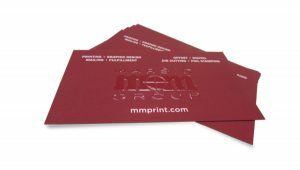 Business cards, invitations, envelopes, and various promotional materials often use Thermography as a tool. It is a lower cost option than embossing. Embossing also creates a 3D effect on your print product. It is less glossy than thermography but allows you a variety of options. From multi level embossing, to blind embossing, to embossing with foil stamping, there are a number of ways to create a classic look. Foil Stamping creates a majestic product. It uses a metallic foil applied with a heated dye. It creates an unmistakable printed product that is often used by large corporations on annual reports or letterhead. If, you would like to make an impression that will leave people with a sense of awe, Foil Stamping is the option to go with. UV is a coating, which, creates a unique glossy look and a layer of protection. Spot UV is applying this process only to a specific area. UV offers some protection from outside elements, while, making your print product shine brightly. Spot UV enhances the look of a certain area of your item. Lighting reflects only in certain angles to make the spot element almost a holographic effect. Aqueous Coating offers a clear coat to protect your printed product from fingerprints and dirt. 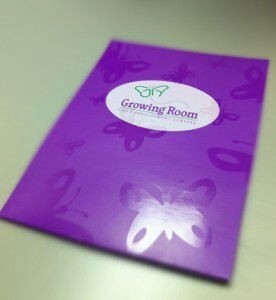 Presentation Folders, Catalogs, and Booklets often use this coating. It helps to increase the quality of the paper, while adding gloss. Aqueous Coating is Eco Friendly as it water based. 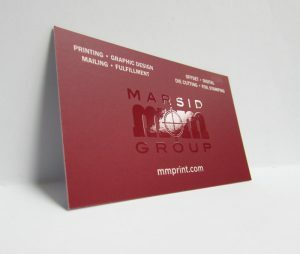 Spot Varnish is a finish, which, adds gloss and depth to a particular area of a printed product. A flood varnish is less common and covers the entire page or surface. Like Spot UV, Spot Varnish adds shine to a specific area. Soft Touch Coating is increasing in popularity as it adds a plush feel and does not affect the look of the item. The soft texture invites people to feel and touch the printed product it is coating. Business cards really see the benefits of a finish like this. Soft Touch Coating is also environmentally friendly. Lamination is a common process, which, adds coating to the front and back of the printed item. It creates protection from creasing, fading, wrinkling, and water. 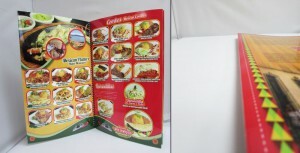 For the latter reason, it is extremely popular with menu printing. There is also a process called velvet lamination, which, is similar to soft touch coating. There are opportunities to combine two or more of some of the coatings and finishes discussed above. 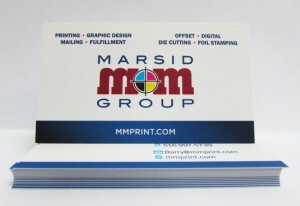 It is best to contact a print professional to discuss what options are available for your project. We can, also, determine what suits your needs and budget. There are certain options, which, cannot be combined. So, it is important to speak with a print professional to decide which options are right for your next project.